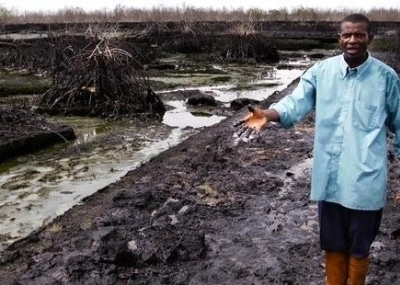 For decades the oil industry in Nigeria’s Niger Delta has caused widespread pollution of land and water, damaging people’s ability to fish and farm, and putting their health at risk. I have worked on Amnesty International’s campaign to urge Shell and the government of Nigeria to address the human rights impact of oil pollution in the Niger Delta for several years. Earlier this month [October] I had the chance to debate with Shell on the issue. The exchange focused on two major oil spills in 2008 at a town called Bodo. During the debate, Shell put forward some entirely new claims about the Bodo disaster. As with many of its previous statements on this case, these new claims do not stand up to scrutiny. The Bodo spills were both caused by leaks in Shell’s pipes and both were allowed to flow for 10 weeks before Shell came to the site to stop them. During the NRK Telethon debate earlier this month, Shell stated that the 2008 oil spills at Bodo lasted only three and seven days respectively. This ‘fact’ is contradicted by all the existing evidence. The oil spill investigation reports for Bodo, compiled by Shell, show that the first spill began on 5 October 2008 – a date itself disputed by the community and the government regulator who both give 28 August 2008 as the start date. The same report shows that the investigation into the spill took place more then one month later on 7 November 2008, at which point the spill was still flowing, as seen on video of the investigation. The second spill was recorded as starting on 7 December 2008 and the investigation, which included stopping the oil flow, was carried out more then two months later between 19 and 21 February 2009. How can this be three or seven days? In an effort to support this completely new and bizarre statement, Shell’s representative claimed his company closed off the oil flows when the spills were reported. In the four years since these spills occurred, this is the first time Shell has made this claim. And if the oil flow was turned off, how is it possible that there is video footage of the oil still flowing on 7 November 2008, when Shell came to the site to clamp the pipe? Shell’s previous statements about Bodo also don’t square with the evidence. For example, the company has denied that a large amount of oil was spilt at Bodo. But the independent assessment we obtained of the rate at which oil gushed from the pipe showed Shell significantly underestimated the quantity of the first spill. Shell also claims it has cleaned up the spills. However, this is disputed by video footage which clearly shows that Bodo remains polluted, as well as the testimony of the community. Shell has said that the damage at Bodo is due to later oil spills caused by sabotage and acts of theft. Amnesty International has asked for the evidence to support these allegations but has received no answers. The people of Bodo are living in an intolerable situation. Their human rights to food, health and livelihood have been undermined by corporate pollution, but they have not been able to get justice in Nigeria. They have now taken their case to the UK courts. Amnesty International is committed to working with communities like Bodo, to help level the playing field between extraordinary corporate power and the victims of corporate abuse. The Norwegian telethon is helping to support this vital work. ~ by FSVSF Admin on 5 November, 2012.